When on July 27th, 1939, Moishe Mieczslaw Najdorf sailed from Antwerp to Buenos Aires on board the Pirapolis to participate as member of the Polish chess team in the Chess Olympiad, little could he have imagined that in a few weeks time the world he left behind would be no more. Lost to the Nazi war machine and the genocide that followed, he no longer had a country to go home to; stranded, Najdorf would have to start a new life. The Polish historian Tomasz Lissowski chronicles Najdorf rise from a promising local player to a strong master to the very beginnings of his international career. Not much information of Najdorf's childhood is known, not even his mother's maiden name is clear, or where even he went to school. 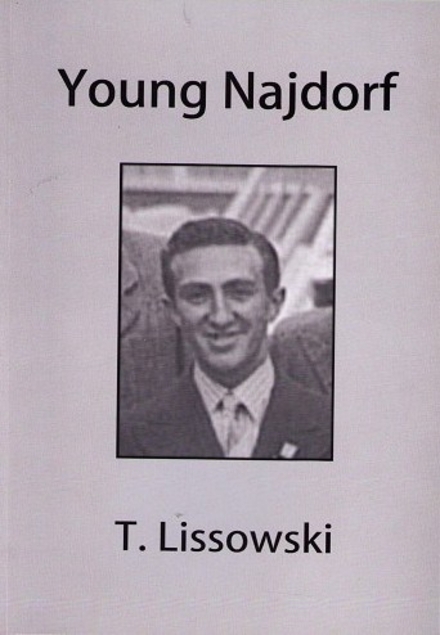 Najdorf in later years often told conflicting stories about his youth, and so much of the documentary evidence was lost in the Second World War.The earliest of Najdorf games that have come down to us are from the Autumn of 1928, when he participated in the Lodz championship for that year. He finished equal 8th - 9th place (5 1/2 points) behind the winner T. Regedzinski (9 1/2 points out of 12). In the game below dubbed " Die Polnische Unsterbliche "(The Polish Immortal) by Tartakower, Najdorf sacrifices seven pieces before mating the White King, but even the circumstances in which this justly famous game was played are in dispute. By 1930 Najdorf was recognized as one of the best players in Warsaw, his second place finish in the city championship that year behind Paulin Frydman, and the drawn match with Frydman that same year did much to cement his reputation. Najdorf placing equal 2nd - 4th place at the third Polish championship (1935) behind Tartakower, earned him a place on the Polish Olympiad team, which took place a few months later in Warsaw. The Polish team placed third behind the United States and Sweden, with Najdorf playing mainly on board three, scoring 9 wins, 6 draws, with only 2 losses to help his team earn a Bronze medal. Following his stellar performance at the Olympiad the Polish Chess Federation sent Najdorf to Budapest to compete in the International Open Championship of Hungary. Najdorf finished 1st - 2nd sharing honors with Lajos Steiner, Najdorf beating Steiner in their individual encounter. Najdorf was asked to join the Polish team that would participate at unofficial "Olympiad" in Munich, at first he refused to play in Nazi Germany, but after being told that Poland's participation and hoped for success was matter of national honor, Najdorf then agreed to join the team. The Polish team placed second winning the silver medal, thanks in large part to Najdorf's performance on second board, he scored 16 points in 20 games (14 wins, 4 draws, and 2 losses). At Margate (1939), Najdorf was asked to replace a player who had dropped out of the Premier tournament, Najdorf for the first time would be facing players of the chess elite (Capablanca, Keres, Flor), though he managed to draw his game with Capablanca, overall Margate proved to be a disappointment. Najdorf could finish no better than 6th place out of a field of 10 with a score of 3 wins, 2 draws, and 4 loses. The Buenos Aires Olympiad was set to begin August 19th, Najdorf playing first game August 24th in the preliminary rounds. Najdorf and the rest of the Polish team were playing very well finishing equal 1st with Czechoslovakia in the preliminary rounds, then moving on to final group A. On September 1st Germany invaded Poland while the finals were still being played, with threat of cancellation of the Olympiad a very real possibility, matches between the belligerent nations were called a 2-2 draw without play. The Polish team finished second with 35 1/2 points, Germany finishing first (36 points), and Estonia third (35 points). Alekhine in his book Gran Ajedrez called the game given below:"A good example of the vigorous style of Poland's second player." Najdorf along with the rest of the Polish team found themselves stranded, he could try to make his way back home or stay in Argentina. He chose to stay at least for a time but when the horrors of Nazi occupied Europe became apparent, Najdorf must have realized that he would have to begin a new life, in time he would have a new family, Spanish would replace Polish and even his name would change, he would in time be known as Miguel Najdorf. There are 192 games, most with annotations from the period and the text is peppered with numerous photographs. A very welcome addition and an important contribution to Polish chess history.